Home / Articles of dentistry / Dental News / Dentalvibe / Odontología Virtual / DENTALVIBE: Stop hurting your patients! 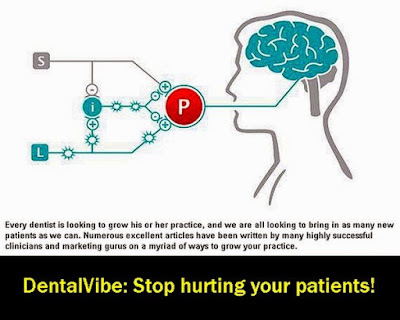 DENTALVIBE: Stop hurting your patients! Every dentist is looking to grow his or her practice, and we are all looking to bring in as many new patients as we can. Numerous excellent articles have been written by many highly successful clinicians and marketing gurus on a myriad of ways to grow your practice. The fact is that as dentists we are so focused on our technical skills while we are performing our craft that we lose sight of one of the most important issues on the business side of dentistry: the patients’ perspective. They are desperately afraid that we are going to hurt them. Many people are so afraid of pain that they avoid going to the dentist altogether. According to worlddental.org, studies by the Dental Fears Research Clinic in Seattle, Washington, report that upwards of 40 million Americans avoid going to the dentist because of this fear. This is quite alarming when you consider the negative health effects directly related to poor oral health. Consider the following scenario. You spend half an hour with a new patient, treating tooth 14 with an MOD composite bonded filling. You carefully excavate the decay, skilfully prepare the tooth with perfect cavosurface margins, etch, prime, place adhesive and composite, and cure for the appropriate period. You spend a great deal of time creating a beautifully artistic representation of occlusal anatomy, and even place secondary grooves in the marginal ridges. Then you polish like you have never polished before. You are proud of the artistic piece that you have created and you have provided a tremendous service to your patient. However, when your patient goes home and reports back to his or her family and friends about his or her dental experience, is the patient going to tell them how wonderful your secondary grooves are? More likely, what the patient will say is whether you hurt him or her. What patients remember is the very beginning of the appointment, the dreaded dental injection. If you anesthetise your patients painlessly, you will be considered a painless dentist. After all, dentistry does not hurt. A filling does not hurt, an extraction does not hurt, and even a root canal does not hurt, because once your patient is anesthetised, you are practising painless dentistry. But if you hurt your patients during the injection process, you are no longer considered a painless dentist. With the use of the DentalVibe Injection Comfort System (Fig. 1), now in its second generation, as an adjunct to the injection process, you no longer have to hurt your patients to help them. This patented, award-winning device utilises revolutionary VibraPulse technology to send soothing, pulsed, percussive vibrations deep into the oral mucosa during the delivery of an injection. This stimulation is perceived by the submucosal sensory receptors, sending a message to the brain, effectively closing the neural pain “gate”, allowing for the comfortable administration of intra-oral injections. Adults and children have reported painless injections and dentists report less stress during the injection process. The device is cordless, portable, non-threatening, easily affordable, has been receiving rave reviews all around the world from key opinion leaders in dentistry, and has been featured on all of the TV news networks. DentalVibe is based on the Gate Control Theory of Pain, proposed by Drs Ronald Melzack and Patrick Wall of McGill University, and published in the Science journal in 1965. According to this theory, there is a gating mechanism located in the dorsal horn of the spinal cord. This gating mechanism either permits or prevents the sensation of pain from travelling up the spinothalamic tract to the brain. When the DentalVibe is used simultaneously during the administration of an injection, the pulsed vibratory impulses generated by the device travel along thick myelinated A beta nerve fibres 37.5 times faster to the brain than the sensation of pain from the injection, which travels along thin unmyelinated C nerve fibres. As the vibration sensation reaches the brain first, a signal is sent to a synapse in the spinal cord, activating inhibitory interneurons that prevent the action of projection neurons, thereby shutting a gate, blocking the pain from the injection. This is one dental product that holds universal appeal to consumers. Nobody wants to feel pain and these days patients are no longer willing to accept it, as they may have in years gone by. Therefore, Bing Innovations, the developer of DentalVibe, has launched a multimillion-dollar patient-awareness campaign, including TV commercials, print advertisements, cinema advertising, Internet banner advertisements and a web-based dentist locator. This tremendous effort is effectively educating tens of millions of consumers on the wonderful benefits of DentalVibe for virtually painless injections and driving patients to those dentists who use it. Give your patients the “WOW experience” with DentalVibe, so that both you and your patient’s can enjoy our wonderful profession a little bit more.